I contacted Michael, who only knew his direct maternal line back to his grandmother (and he wasn't even positive of her maiden name), but he believed she came from Sziget (today's Sighetu Marmației, Romania), which is not too far from where my direct maternal line lived. I asked him to take an autosomal test, which he did, and I wrote about how he shared large segments with several members of my mother's mother's family. Based on that, I was confident that the connection was close enough that I'd be able to find it. But it was harder than it should have been. Michael knew that his maternal grandparents were Solomon and Lena Hans. He (and a cousin) thought that Lena's maiden name may have been Greenberg. The 1920 census had Salomon and Lena Hans, both aged 24 (implying birth year of around 1896), both having immigrated in 1913. So they would likely have come over independently as teenagers and married in New York. Their oldest son was 21 months old at the time the census was taken (January 1920), so they would have married by 1918. I figured I would be able to find their marriage certificate, which would have their parents' names, and I'd be set. 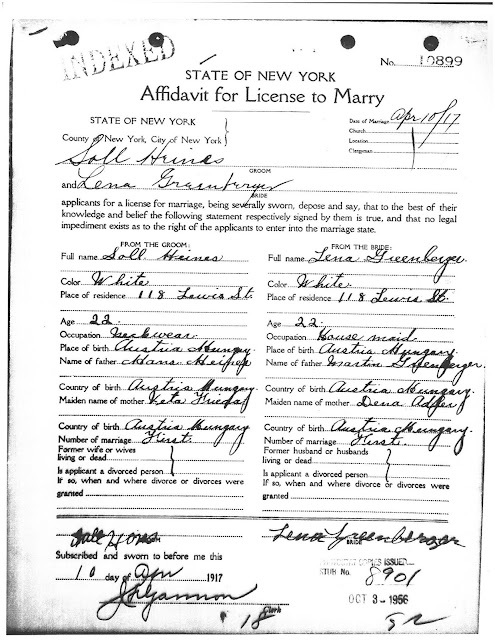 Well, despite searching multiple ways using SteveMorse's portal to ItalianGen and New York marriage certificates, I simply could not find the index to their marriage. So I went to immigration records. Because I've indexed an insane amount of records from the area from which Lena emigrated, I had a hunch that her surname was actually Grunberger, a common name in the area. There were also many Helenas born in the area. So with a bit of crazy searching and trial and error, I found her. I've indexed Nemet Mokra vital records--but only until 1895, when civil registration started. Through my work with JewishGen's Subcarpathian SIG, we will hopefully get and index Nemet Mokra records, but that may not be for some time. So I don't have Lena's 1896-ish birth record. But I do know that Lena's father's first initial was "M," based on her ship manifest. Looking at pre-1896 birth records in Nemet Mokra to hopefully locate Lena's siblings (which I indexed and will soon be on JewishGen--but aren't yet), I did see that there was a boy named Burech Hers who born in 1892 to a Marton Grinberger and a Chaje Dina Adler; the birth was registered in Orosz Mokra, adjacent to Nemet Mokra. Burech Hers was the name of my great-great-great grandfather (whose wife would have had my mtDNA), so that was interesting. The same couple had another child born in 1894. A son named Jakob was born in Maramaros-Sziget in 1912 to Chaje Dina Adler. The parents must not have had a civil marriage (which was not unusual--and was the case for my great-great grandparents as well), so the father claimed paternity--and his name was Marton Grunberger. At this point, I was pretty confident that these were Lena's parents, so I started looking at Chaje Dina's ancestry. So it turns out that yes, Michael and I are related through our direct maternal lines (assuming Chaje Dina was Lena's mother, of course). Our common ancestor direct-female ancestor is a woman I will call "the wife of Mendel Volf Muller," since I do not know her given name. She was the 5th great grandmother of both myself and Michael. 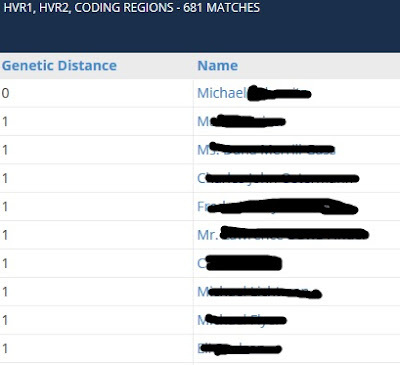 So Michael and I are sixth cousins. Now, you may question how we share so much autosomal DNA given that our mutual ancestors were seven generations back. Well, in tracing Chaje Dina Adler Grunberger's ancestry, I discovered that Michael and I are also fifth cousins in at least one way (and possibly two--I'm still working on that one). But of course, all of this would only work if Lena's parents actually were Marton and Chaje Dina. Remember I'd tried finding their marriage certificate to no avail? Well, thanks to the awesome folks at Reclaim the Records, we now have access to an index of New York City marriage license applications. And there I found that in 1917, Soll Heines and Lena Greenberger applied for a marriage license. I sent away for it, and it arrived last week. So when people say that mtDNA isn't helpful in genealogy, that isn't necessarily true. You won't know if it will help you until you get the results--and successes are possible! Absolutely amazing!! Thank you so much, Lara - for all your diligent research! I am Michael's first cousin, the son of David Hans (Ruth's youngest brother) born in 1921, after the census - and therefore not included on it). I really appreciate your efforts - and look forward to learning more!